Stanza 1 - The boy weeps because a snowman stands alone outside and is about to suffer through a harsh night. Stanza 2 - The snowman does not want to go inside and melt, but he feels thankful for the boy's worry of him. 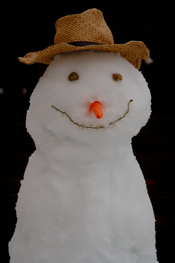 English: A picture of a stuffed snowman I took. WriteWork contributors. "Connotations, themes, attitudes, and other meanings of "Boy at the Window" by Richard Wilbur" WriteWork.com. WriteWork.com, 14 December, 2003. Web. 18 Apr. 2019.